There seems to be no end in sight to the political machinations that have ensued after the Karanataka election results threw up a hung assembly. The battle for Karnataka has become fiercer, uglier and more mysterious with both the parties claiming to have full majority and confidence to form the government. On one hand, the JD(S) and the Congress have handed over signatures of at least 117 MLAs to governor Vajubhai Vala, BJP's CM candidate BS Yeddyurappa seems overconfident after meeting the governor, and has claimed to take oath as the Karnataka chief minister on Thursday. The Congress party, which has alleged massive horse-trading attempts by the BJP, says the saffron party leaders are offering Rs 100 crore to each for their candidate to support the BJP. The party is also believed to have taken all of its MLAs to a plush resort in Bengaluru with a fear that some of them might shift their loyalty. As the political circus in the southern state plays out, we bring you all the latest updates of the Karnataka Assembly election result. 10.26pm: By giving 15 days time (to prove majority) Governor is encouraging horse-trading by BJP leaders, this is unconstitutional. We will discuss the future plan: HD Kumarasway JD(S) on Karnataka Governor's invite to BJP to form government. 10.22pm: Congress leader and senior advocate Abhishek Manu Singhvi to approach the Supreme Court tonight against the governor's invite to the BJP to form the government in Karnataka. 9.37pm: BJP Karnataka in-charge P Muralidhar Rao says the governor has invited BS Yeddyurappa to form the government in the state of Karnataka. "Just now, the governor office has sent a letter to BJP CM candidate BS Yeddyurappa to form the government." 9.20pm: Karnataka BJP deletes the tweet announcing BS Yeddyurappa's swearing-in as Chief Minister of Karnataka, tomorrow. 8.45pm: Congress spokesperson Randeep Singh Surjewala says if the Karnataka governor has invited the BJP to form the government, it is shocking. "Will tentamount to murdering democracy, trampling Constitution and disregarding all precedents. Majority will can't be subjugated at the whims of BJP and Modi Govt." 8.39pm: Senior Congress leader Kapil Sibal says the governor seems to have given the BJP a chance to poach MLAs, and that the governor should work on principles. Taking a dig at Prime Minister Narendra Modi, he also said the BJP's "Man Ki Baat" has now become "Dhan Ki Baat". 8.33pm: Congress leader Ashok Gehlot says all the Congress MLAs would stay together as they have been compelled to do so due to the BJP's horse-trading attempts. 7.40pm: "He thinks he is the boss of the party, the party has suffered because of his arrogant behaviour. He is not a true Congressman. Many people have this view of him but don't express it," KB Koliwad, outgoing Karnataka Assembly speaker and Congress leader on Siddaramaiah. 7.30pm: The BJP is likely to form the government tomorrow; Yeddyurappa may get invite to form the government tonight, reports India Today. 7.10pm: In the next couple of hours, the governor is expected to invite the BJP to form the government, reports India Today. 6.57pm: BJP CM candidate BS Yeddyurappa says he will take oath tomorrow; JD(S) give a list of 117 MLAs to the governor. 6.56pm: The Congress party has said it will move the Supreme Court if the governor invites the BJP to form the government. 6.30pm: ANI reports: BJP MPs Shobha Karandlaje, GM Siddeshwara and PC Mohan write to Union Home Minister Rajnath Singh stating: "We have every reason to believe that Karnataka govt is misusing its power and tapping our mobile phones. This is clear violation of our fundamental right to privacy." 6.05pm: Governor has assured that he will take action as per the Constitution. We have full faith in him that he will not do injustice. We have our numbers, not not even a single member has moved out. We will not allow any such thing to happen, says DK Shivakumar, reported ANI. 04:15 pm: Congress party is expected to move Supreme Court if BJP is invited to form the government. 03:30 pm: Signatures of JD (S) and Congress MLAs are being taken in support of JD (S) leader HD Kumaraswamy. The document will then be submitted to the governor later in the day. 02:00 pm: If needed, Congress may complain to the president and parade the MLAs before him. 01:48 pm: Congress might approach the Supreme Court in case the governor calls BJP first. 01:44 pm: Congress-JD (S) might parade all MLAs before the governor. 01:30 pm: Reports suggest that the Congress is mulling three options in view of the race to form government in Karnataka. 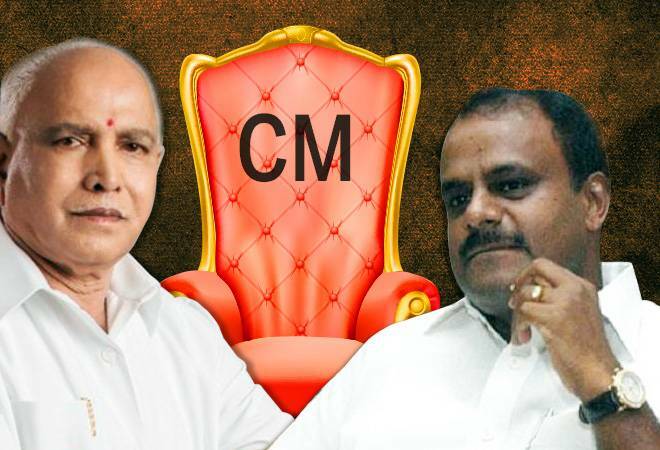 12:20 pm: In a shocking statement, Kumaraswamy said, "Few of JD(S) MLAs were being offered Rs 100 crore and a berth in the cabinet if they joined BJP. I question, where is this money coming from? What is the Income Tax department doing?" Kumaraswamy then posed a question to the President of India and the prime minister. "I appeal to the president and PM Modi whether they are promoting horse trading?" 11:55 am: Congress-JD(S) chief ministerial candidate HD Kumaraswamy thanked the Congress for its support and attacked BJP for its tactics to stop them from forming the government. 11:30 am: Addressing the media outside Raj Bhavan in Bengaluru, BJP's chief ministerial candidate BS Yeddyurappa said, "I have given the letter to the governor and he will call me, that is what I am hoping. He told me that he will take an appropriate decision."